Enjoy a cocktail (or a few!) 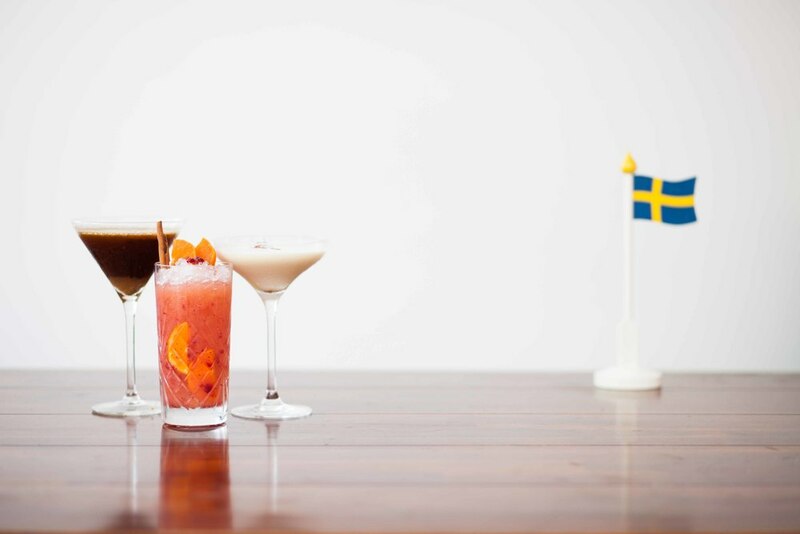 from our specially designed Christmas Cocktail Menu inspired by seasonal ingredients from Sweden. Our Drinks Menu has been created by Co-Founder & award winning mixologist Fredrik Olsson. Christmas breakfast, lunches, dinners and other bespoke events are available for groups of 20 & above and can be arranged outside of normal business hours. Please email christmas@skandilicious.co.uk for details. Tickets to the Swedish Christmas Feast are £45 and include a welcome Glögg and the all-you-can-eat Swedish Christmas Smörgåsbord. Snaps [snaps] is a Swedish word for a small shot of a strong alcoholic beverage taken during the course of a meal. Drinking snaps is a tradition in Sweden and the Scandinavian countries, where it is very common to drink snaps at holidays such as Midsummer, Christmas and Easter. Try our carefully curated selection of Snaps and join the Skandilicious sing-a-long-song. We don't like wasting paper so instead of bringing a printout of the booking confirmation the lead booker of your party will be required to present his or hers ID together with the booking reference upon entering the venue. The ticket price includes a warm welcome drink and the all-you-can-eat smörgåsbord. The tickets do not include any drinks other than the welcome drink. You will be able to order soft drinks, wine, beer, cider, snaps and cocktails from our waitresses and waiters before, during and after the meal, and all drinks are payable at the end of the meal. I want to buy a certain number of tickets but cannot find enough availability – can you help? If you are unable to find enough tickets for the same day, please contact Skandilicious directly (christmas@skandilicious.co.uk) to be advised on availability. We will do everything we can to help you find a suitable date and time for your party. Where will Swedish Christmas 2018 take place? The 2018 edition of Skandilicious will be popping up at 343, Fulham Road, London SW10 9TW. The nearest tube stations are Gloucester Road and South Kensington. There are plenty of buses that stop on the Fulham Road where the venue is located. What are the opening hours of Swedish Christmas? Swedish Christmas will open its doors for dinner at 18:00 most days and at 12:00 for weekend lunches (please check your ticket as there may be a few exceptions). The venue closes at midnight. Yes there is wheelchair access into the restaurant however we are sorry to say that the toilets are located on the lower ground floor (narrow stairs, no lift). Please contact us directly if you have any queries - we promise that we will do what we can to help. Please contact the Skandilicious team on christmas@skandilicious.co.uk or on 0207 859 4780 if you have any questions. With 60,000 Swedes living in London and a large part of our capital gripped by “Scandimania”, Fredrik Olsson & Maria Trechman set up Skandilicious to help make our city a little sweder. Dedicated to delivering contemporary yet true-to-tradition Swedish experiences, they combine an impressive portfolio of hospitality, event, culinary and design expertise, to create an authentic and truly unique experience this winter. Passionate about preserving Swedish heritage and excited to engage new audiences in a unique and creative way, Maria & Fredrik bring together a Christmas treat quite unlike any other.